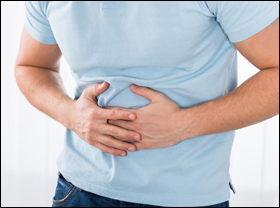 Too much of air or gas in the stomach or intestines due to the waste gas produced during digestion and which bloats the organs is called Flatulence. It is the passing gas from the digestive system out of the back passage. It's more commonly known as "farting". 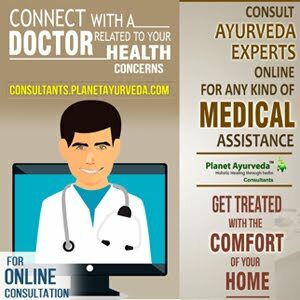 WHAT IS FLATULENCE AS PER AYURVEDA? As per Ayurveda Flatulence is called Aadhaman. The cause of it is due to an imbalance of Vata and Pitta Dosha. Pitta in body represents the presence of heat or fire. Pitta controls the digestive fire or jatharagni in the body which is the fire that helps in digestion of food. Vata symbolizes air or wind. Poor and weak digestive fire is cause of low Pitta Dosha and aggravated Vata Dosha. Which results to hampered and disturbed digestion. Impaired digestion of food leads to flatulence. WHAT ARE THE CAUSES OF FLATULENCE? WHAT ARE THE SYMPTOMS SEEN IN FLATULENCE? WHAT DIET & LIFESTYLE SHOULD BE ADVISED? Should follow vata-pacifying, easily digestible and nutritious diet. Avoid raw foods, even raw salads, sprouted beans and pulses. Use vata-pacifying herbs like asafetida, celery seeds, cumin seeds and cardamom while cooking. Whole wheat and brown rice are helpful. Food should be ate in calm and soothing surroundings with no disturbance. Always fresh and warm food should be eaten whenever you feel hungry. Practice Vajrasan and Agnisaar Pranayama Yogasanas daily. Millets - Bajra may cause acidity. Note – Rich in fiber and good for acidity. Spices like red chili (lal mirch), green chili (hari mirchi), cloves (laung), and black pepper (kali mirch) should be avoided in the acidity problem because they cause the heartburn and stomach upset. Fennel (saunf), Carom (azwain), Fenugreek (methi), Cumin (jeera) And Coriander (dhaniya) are good. Herbal tea made from cumin-jeera, coriander-dhaniya and fennel seeds - saunf is good to have. Take Indian goose berry –amla powder daily after meal. Mixture of Indian goose berry, fennel and licorice powder in quantity of 1 tsp is good after each meal. Lentils can be taken which are light to digest. WHAT ARE THE HOME REMEDIES WHICH HELP TO GET RID OF FLATULENCE? 1. Fresh slice of ginger with pinch of rock salt (black salt) 10mins before and after meal which helps in improving digestion and avoid bloating. 2. Fennel seeds have cooling effect which pacifies the pitta and improves the digestion. Tea made with fennel seeds controls bloating, gas, cramps, abdominal pain and it also act as a diuretic. 3. Cumin seeds have cooling effect which pacifies the pitta and improves the digestion. Chew half teaspoon of cumin seeds till it turns into paste. 4. Make a decoction using coriander, cumin and fennel seeds- all these herbs have cooling effect that increases and improves digestion. It reduces the abdominal pain, gas and flatulence. Boil all these ingredients in about 400 ml of water. 5. Mint has calming and cooling effect which pacifies the pitta dosha and improves the digestion. Chew the fresh leaves of mint. Make a decoction of mint leaves and water. Make a paste (Herbal chutney) of fresh mint leaves, cumin seeds powder and add a pinch of salt. Eat this paste twice daily. 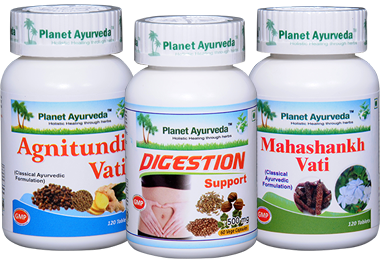 Planet Ayurveda offers pure and herbal products which are prepared under the guidance of MD Ayurveda keeping in mind the Ayurvedic concept. These are free from chemicals, additives and preservatives. It is in form of tablet and is formulation of herbs like Pippali (Piper longum), Chitraka (Plumbago zeylanica), Danti mool (Baliospermum montanum), Marich (Piper nigrum), Shunthi (Zingiber officinale), Hingu (Ferula-asafoetida). These herbal tablets control hyper acidity, burping, heart burn and abdominal pain. DOSAGE: 2 tablets twice daily with plain water after 30 mins of meal. It is in form of tablet and is formulation of herbs like Triphala- (Amalaki (Phyllanthus emblica), Haritaki (Terminalia chebula), and Bibhitaki (Terminalia bellirica), Cumin (Cuminum cyminum), Ginger (Zingiber officinale), Pippali (Piper longum), Black pepper (Piper nigrum), Vidanga (Embelia ribes) and few more. It balances pitta doshas. Increases the appetite and supports healthy digestion. It’s an herbal combination in the form of capsules. The herbs used are Amalaki (Phyllanthus emblica), Haritaki (Terminalia chebula), Bibhitaki (Terminalia bellirica), Fennel (Foeniculum vulgare), Dhania (Coriandrum sativum), Pippali (Piper longum) and Jeerak (Cyminum cuminum). It is an herbal supplement which promotes and encourages the digestive system which reduces the formation of acidity. DOSAGE: 1 capsule twice daily with plain water after 30 mins of meal.